“Zum Storchennest” (The Stork’s Nest) is located in the beautiful Steinalb valley, situated in the middle of the nature preserve of the Palatinate Forest. Guests can choose from elegantly decorated single and double rooms or comfortable holiday apartments. All rooms are fitted with showers, bathrooms, hair dryers, satellite TV, phone and Wi-Fi. The diverse breakfast buffet will give you the perfect start to your day. Special rates and services are available for hikers/pilgrims, bicyclists and motor bikers, so please ask us about our varied rates and offers available to you. 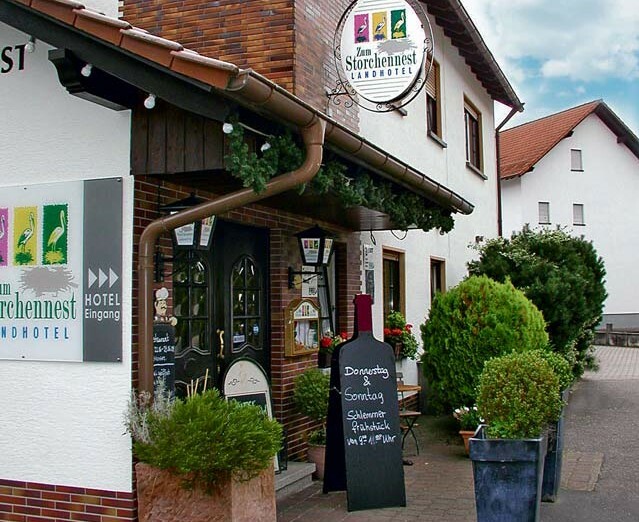 A varied selection of international and Palatinate specialties await you at Restaurant ‘Zum Storchennest,’ ranging from homemade meat and fish dishes, Saumagen (cured pork and potatoes), game specialties and vegetarian delights. Only fresh and regional products are used according to traditional recipes. All meals are also prepared for take-away. 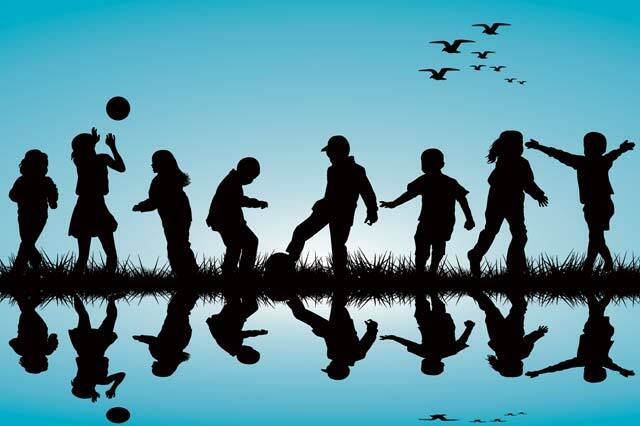 You can celebrate weddings, christenings, confirmations or communions here. Enjoy your special day and let us do the worrying. Stay overnight at our hotel next door and round off the celebrations with a gourmet breakfast the next day. If you prefer to invite your guests to your home, we will take care of the catering for you. The Stork’s Nest is a much-loved restaurant for larger groups (up to 60 people), since busses can park in front of the restaurant. Noon to 2 p.m. and 6 to 9 p.m. daily, except for Sundays when the kitchen is open only from 9 a.m. to 5 p.m. The Stork’s Nest in Bann offers more than comfortable accommodations and traditional food. 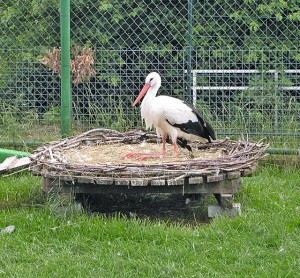 The family also cares for sick and injured white storks. For more than 40 years, the family has been nurturing these animals back to health in their aery. Since Aug. 4, 2007, storks Fritz and Marie have been enchanting visitors with their bill-clattering. Note: When ordering drinks and food marked with a stork on the menu, we will donate €1 to the resettlement and preservation of white storks. In Germany, the white stork is also called “Adebar” or “Klapperstorch” (clatter-stork). With a wing span of up to 2 meters, the white stork is one of the largest birds in Germany. The stork grows up to 1 meter in length and approximately 80 centimeters in height, weighing between 2.5 and 4.5 kilograms. The storks’ feathering is white, except on the back and wings, where the feathers are black. Their bills and legs are red. Storks can be found across Europe in wet, swampy areas. They mainly survive on frogs, lizards, snakes and insects. Storks love building nests made from twigs and branches on top of roofs, trees and rocks. The nest can be up to 2 meters in diameter up to 4 meters high. A pair of storks migrate to Africa for winter. During migration, they avoid the Mediterranean sea due to the lack of up winds in the air. months. A pair of storks often live together for many years.